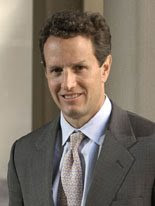 gary-weiss.com: Nepotism in the Geithner 'Beautiful People' Selection? Nepotism in the Geithner 'Beautiful People' Selection? Joe Weisenthal has an amusing item today at Businessinsider suggesting that nepotism may be the reason for Tim Geithner (gulp) appearing on People magazine's list of 100 most beautiful people. Geithner's brother David Geithner, is a People executive, having been at Time Warner (TWX) since 1992. This 1992 wedding announcement confirms they have the same father. And they look similar! I'll admit that it looks suspicious. But my hunch is that it is a coincidence, given the church-state separation at Time Warner.